When my Tunnels & Trolls hardcover arrived, I was immediately drawn to the glossy color section. I’d mostly ignored Trollworld when I read the rules in my softcover copy, figuring if I ran it I’d homebrew a setting . . . but this map has me rethinking that. 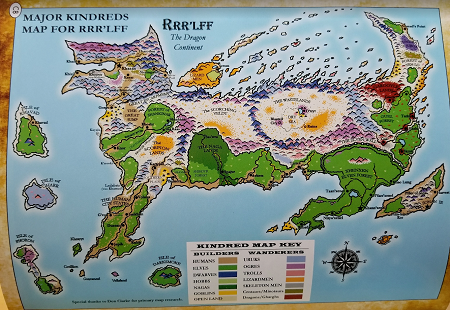 Rrr’lff is Trollworld’s main continent, and it was created by an egomaniacal dragon-wizard in his own likeness before the Wizard War.